I got a chance to stop by the Samson booth at CES yesterday and check out the new Zoom H4N digital audio recorder. 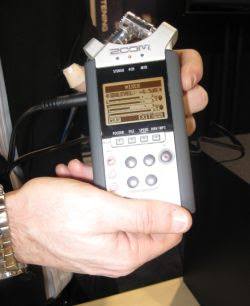 This flash recorder is an upgraded version of the Zoom H4, but Zoom and Samson don’t plan to phase out the older model. Rather, they’ll now offer flash recorders in three price ranges, $199 for the Zoom H2, $249 to $299 for the Zoom H4, and $349 for the zoom H4N, which is a bit closer to being a pro audio device. The new recorder should begin shipping in February viagra et tarif. Zoom has made a number of significant changes to the Zoom H4 design for the H4N. For starters, the new model has a rubberized grip which makes it feel like a much more solid device. The older model feels like cheap plastic by comparison. The H4N also has a much larger, easier to read display and the button layout makes the menus much easier to navigate. The built in stereo condensor microphones can also be rotated to adjust the pickup pattern. And you can now record four separate tracks simultaneously by using the two built in mics and the two XLR inputs. Probably the most important change is that Zoom says it is using better preamps for the XLR inputs. I always thought the Zoom H4 sounded excellent when you use the built in mics, but the moment you plug a microphone in, you wind up picking up a hissing noise. I wasn’t able to test the preamps on the noisy show room floor, but hopefully I’ll be able to get my hands on a review unit soon so I can see how the H4N stacks up against the Zoom H4 and the Sony PCM D-50. I wouldn’t really expect it to sound as good as the Sony recorder which sells for over $100 more. But if it comes close, this recorder could be a steal at $349. Update: You can also find the official spec sheet and some higher resolution images here. I wanted to pass along a comment by a fellow connected with the Nature Sounds Society listserv, whose name is Oryoki. (This information came to me by way of Dan Dugan (Dan Dugan Sound) in reply to my inquiry to see what Dan had to say about this new device). “A little more testing of my H4N revealed some quirks. First, if you try to record using a single mic connected to XLR with phantom power on, the other channel records a relatively high level of noise. This seems to be caused by the unterminated XLR input. Plugging in a second mic, but leaving it turned off, reduces this noise. Second, with phantom power on, the noise level is higher than with it off and the mics receiving power from an external power source (ART Phantom II in this case). Third, the 1/8-inch (3.5 mm) minijack on the rear of the recorder has less self-noise than either XLR input. Recordings made with a Rode NT1A mic powered by an ART Phantom II power supply and connected via the minijack had very low levels of self-noise. Fourth, the right XLR of my H4N has a higher self noise level than the left XLR input. The difference is quite noticeable. Hai, i am frm chennai,South India,could u help me to buy,Zoom H4N audio recorder in India,may i know the dealer to purchase r where it is available in Asia,especially in Singapore address of shop to purchase Zoom H4N.